Embrace the scenic glory of Ohio’s Pymatuning Valley with a campground membership at Pymatuning Valley Resort. This beautiful campground offers a variety of accommodation options to suit parties of all sizes and interests. 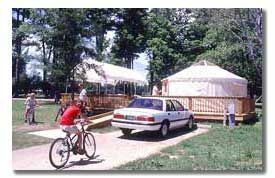 Whether looking forward to basic camping or if glamping is more your style, you are sure to enjoy your stay at Pymatuning Valley Resort. With a campground membership for sale at Pymatuning Valley Resort, you will enjoy flexible accommodations options paired with a long list of on-site amenities. Pymatuning Valley Resort boasts three on-site lodging options, including cottages, barn-style cabins, and loft dwellings. Each accommodation type varies in its amenities, but includes such in-unit fixtures as a partial kitchen, full electricity, and grilling area. 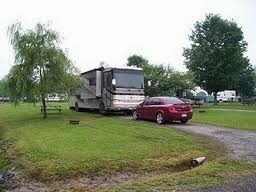 For those traveling via recreational vehicle, enjoy RV hook-ups featuring spacious lots and ample privacy. Standard camping lots are also available for those looking for a more down-to-earth and rugged getaway. Pymatuning Valley Resort provides a true one-stop shop for vacation fun. Enjoy full access to all resort amenities, including countless sports courts for a friendly game, hiking and nature trails, swimming pool, playground with jungle gym, fire pits perfect for roasting marshmallows, a game room, and an adults-only clubhouse and lounge. For your convenience, the resort also offers a well-stocked camp store and laundry facilities. With the resort’s idyllic location in Pymatuning Valley, your campground membership for sale puts you in the heart of Mother Nature’s great outdoors. Explore all that rural Ohio has to offer while visiting such nearby attractions as Deer Park Nature Park. The Conneaut Railroad Museum provides history buffs with a look at yesteryear and the evolution of the railroad in the Mid-Atlantic region, making it the perfect stop as you explore the area. Contact Pymatuning Valley Resort Specialist Today!